If it's not your first time in this site, you might have noticed that I go crazy making colorful and strange things and wearing them with pride and joy in public. In this list of diys first come the necklaces made from unexpected materials and second the earrings. And althought I am cursed to be allergic in all kinds of metalllic materials that penetrates my earlobe, I don't have the biggest collection of big, dramatic earrings (as I would love to). Only some clipped, light ones. With that said, clipped and covered with confetti will be today's happy earrings. And to make long story short, I proudly presnt you the diy that will make your day! 1. First draw your earring's shape on a piece of paper. Then Put the sheet of PVC on the patron and copy it. Cut your shape and voila. 2. Apply a thin layer of atlacoll on one side of the earring and dip it into confetti. The purpose of this fun procedure is to cover all the side with confetti, without leaving naked glue parts (the glue turns transparent when it dries so you don't want transparent gaps). Let it to dry and apply do the same on the other side too. I would recommend applying 2 layers of confetti in the front side. Repeat the same with the other earring. 3. If you want to give the earring a rotation better do it as long as the glue doesn't dry, cause otherwise your earring will stop being flexible. When they are absolutely dry, using the silicone pistol glue the earring clips on the back side. If you don't have a silicone gun, you can always do the same with a little ammount of atlacoll. Afterwards secure any almost-flting cobfetti and cut the excess confetti from the edges. 4. Wear your new cuties and collect your friends' compliments. Arent't they absolutely perfect? And with an excess of excitement I announce you that you can buy a customized pair of the earrings in our etsy shop or buy an diy kit to make them on your own. My kitchen’s lamp fixture was a bare lamp holder for a long time, since I didn’t know what to do with it. You know that I spend so much time in the kitchen preparing delis, so if I was going to have a lamp fixture it would be something that would create a nice focused light. And also I was collecting kitchen paper towel rolls for a long time with out knowing what I would like to do with them. 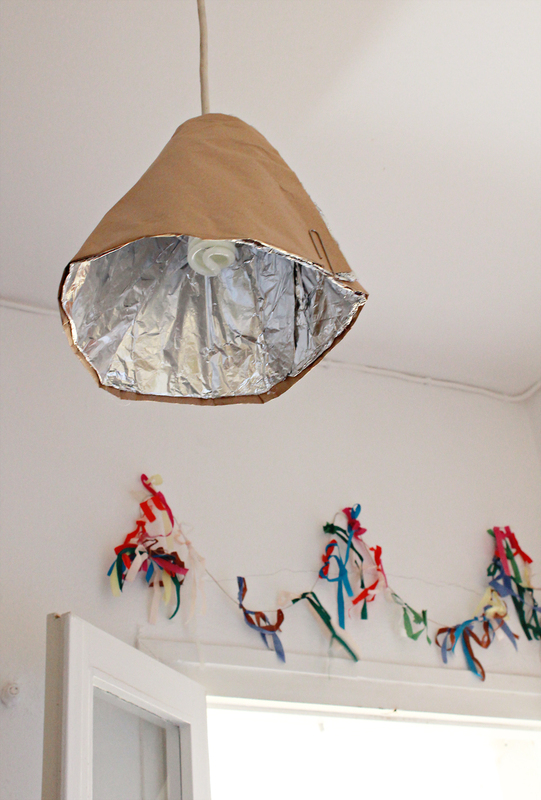 Until it hit me, a lamp fixture made by kitchen paper rolls. Boom! 1. Cut the kitchen paper roll alongside, with the knife and end up with an open rectangle. 2. At the bottom corner of the rectangular put liquid silicone and glue that corner with the next triangle’s one diagonally. Press it for some seconds and it’s ready. 4. The internal side of the lamp (the one facing towards the lamp) will be covered with aluminum foil. Don't mind if the foil can be showed to the external side, that one will also be covered with paper. Add silicone glue between the gaps and edges of the aluminum foil, so that you have a compact, solid surface. 5. 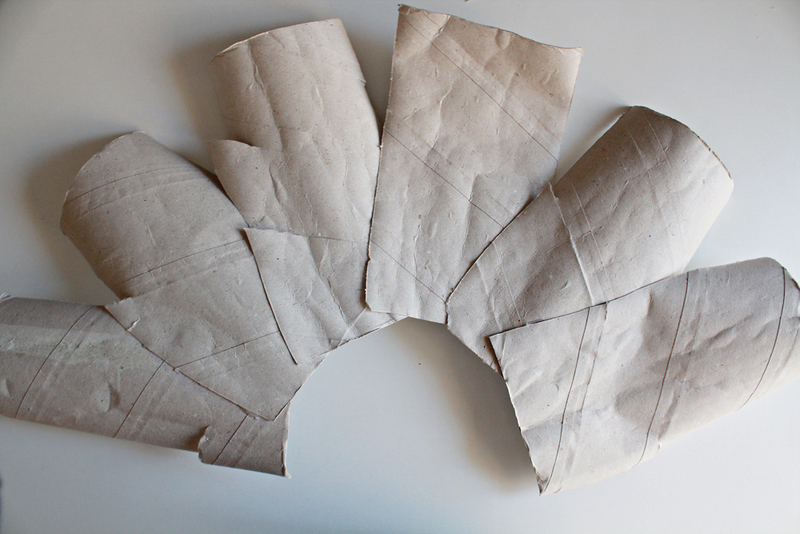 Place the open cone on a big piece of recycled brown paper (or any other print or fabric) and draw its pattern. Let 2-3cm of excess paper around its perimeter when cutting it. Fold these 2-3cm “ears” inwards, put silicone on them and glue on the external side of the open cone. Add silicone in any big openings and anywhere else needed. Let it dry and then close the cone and keep it fixed like that using a big metal clip. You can do that with glue too, but I love to idea of hanging and unhanging it whenever I feel so. Plus there is 6. below, where you have to open again the cone. So use a clip. 6. There is the possibility that when closing the cone, the upper cone's hole won't stuck on the lampholder (eg. like in my situation). If that happens, so the following. Take an old jar’s cap and find its center. Cut a circle around it (big enough for the lamp’s cable to pass through fit) and cut its radius too. Beware of your fingers and do that on a concrete floor, not on wood or tiles please. 7. Set the cap-holder around the cable and then on that place the cone-lamp fixture. And it's ready. The foil in the fixture’s inside creates a very beautiful focused light and because of fixture’s structure the upper side of the room remains some tones darker than the lower part of the room. Nice effect, huh? Happy crafting and if you want more home diys check my crafts index here. What they say about the handmade pieces, that the inspiration for them can come from almost anywhere, it's completely true. In these cases of unexpected inspiration, the joy of creation is even greater. For instance: You are eating pistachios while watching a movie that you hoped you liked more. Alongside toy empathize the main character's drama by wondering how could you reuse this compact (the shells) raw material creatively. Op, bright idea. You stop the movie, get up, go to the kitchen, remove peels and soft pieces off the shells, wash them and leave them to dry, cause tomorrow a total transformation is waiting for them. Going to sleep happily. The -creative- end. 1. Arrange the shells in the shape that the final necklace will have, with their openings facing downwards. 2. Using the silicone gun glue the all shells, by securing those which contact. Beware with the glue's flow, this is of course the back side of the necklace and you are entitled to make a few more messes. 3. Glue the secure ends with the string's end and press the secure end's ears to grip well (use a handle pliers or a pair of scissors to do so). 4. Having done the security ends, cut a generous length of string on each side and check to find the in which height of your neck you want the necklace to be. If using hard strings before securing it to the necklace note to have the concave string's side facing to the inside-to your neck. 5. Break a little piece on the top of the last shell in each side, so that the string can fit inside the shell's pit. Fill the pit with silicone and the dip the string inside to stick really well. 6. I liked my necklace to be black, but you can paint yours whatever color you desire using tempera colors. If you paint it a lighter color, go with a lighter shade to cover the shell's color and create a base. Then use darker shades to the diagonal bottom corners and lighter ones to the diametrically diagonal up ones. This trick will create the effect of artificial shadows and the necklace will look very impressive. I also added some glitter in the shell's pit, so when light falls on it its really cool. 7. Now, for the back side, in order to hide the bumps of glue, I painted the necklace one darker hue than the shell's natural color and I added black-gray brushstrokes to the diagonal lower corners to create some artificial shades. So now can be worn by two sides. Win-win! By the way, every great necklace that respects itself, will ask for a photoshoot to be featured. Vasilis and me satisfied its request by photographing it one warm summer afternoon. See the whole photo shoot here - it was such a fun one to do! I hope to inspired you to make an original necklace next time you wonder, which one would match with your outfits. Don't be afraid to experiment with shapes and colors. Whoever is an amateur or professional photographer here, might have noticed that it's a bit awkward passing from the photographer's "safety" to lens' exposure. Well, I have already the stigma of "Debbie-with-the-fancy-camera", so everyone is so assured of me taking all the trip's/happening's photos and then sharing them to everyone. I am not grumbling here, not at all; I love this role. I am a perfectionist with my memories, so I want to choose what I want to immortalize in my photos. what will I be immortalized. Therefore, as I prefer being behind my camera, it took me long to start appearing in the blog. I believe that a start was made for the needs of photoshooting my necklaces and this new necklace couldn't be an exception and be left in the dark. Oh this necklace is perfect and maybe one of my best ideas. It is made from peanut shells, glued with silicone and painted with tempera colors. The raw material is is transformed so much, the only thing unaltered is the marvelous structure of the shell. And you are left to wonder, the raw material of this necklace. And it's so special, it can be worn by two sides creating a different texture every time. The whole procedure of making is HERE. Also, if you want to check the rest of my necklaces, find them all here! The first side, the one with shells' openings, is black with a little black glitter in the openings' recesses. The back side is mustard with black shadows and exploits the curved portions of the shells.